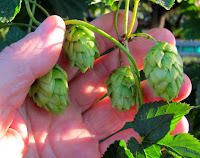 If fresher is better, fresh hop ale must be best. Since hops are harvested just once a year, late summer is the only chance for craft and home brewers to succumb to the drop everything urgency to make this unique harvest season ale. Once picked, fresh hops are added to the boil within 24 hours. Because drying concentrates flavors, six times as many wet as dried hops are required. But whoa, what an aroma and bittering difference between hops that are picked and pitched into the boil within a day, and hops that have been picked, then processed, then dried, and finally bagged and put into storage. Think present tense vs. past; imagine morning grass, dripping wet with dew vs. dusty straw, field dried and baled months ago. 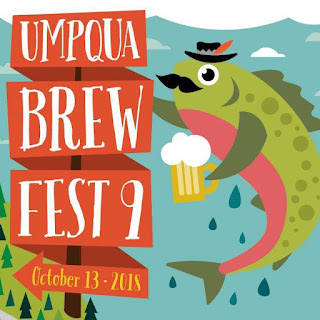 Time is prime to cook a batch, like the Deschutes brewers do about now each year. 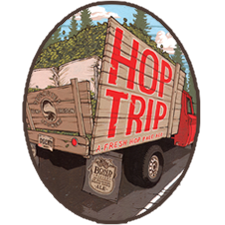 They make the four hour trip back to Bend to toss freshly harvested hops into their cauldrons. Come October their award winning once-a-year beer, Hop Trip, is ready for celebrating the changing of the seasons. 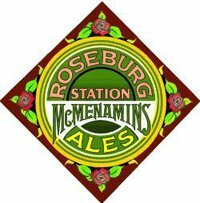 Enjoy a local fresh connection on tap: Hopqua fresh hop ale is made with a cornucopia of cones grown locally in the Umpqua Valley, and generously donated by patrons of McMenamin's Roseburg Station. Depending on what the hop garden growers bring in, Tom Johnson, McMenamin's brewer, estimates about 38 pounds will be added late in the boil, and that his Hopqua and the company Thundercone fresh hop ales will be ready toward the end of September.